At our model center in Victoria, TX, our homes, our service and our sales team are second to none! Check back to our website regularly for our latest special offers, home, news, and more. Huge Savings at Palm Harbor in Victoria's National Red Tag Sale! It is time to clear out our model year inventory of manufactured homes with a giant RED TAG sale here at Palm Harbor in Victoria, Texas! We are taking massive discounts on many of our most popular display models to make way for 2019 models! Don't miss this once-in-a-lifetime chance to save on the beautiful new home you've been dreaming of! Let's get you a home for the holidays - - or at least for the New Year! The best deals and the best homes go FAST!! As a company, Palm Harbor is committed to helping Hurricane Harvey survivors who have lost their home replace it without fear of unfair, opportunistic price gouging. We call this our FAIR PRICE PROMISE. Many of our friends, relatives and customers are returning home to the Texas Gulf Coast to sadly discover that you are in need of a replacement home due to Harvey's destruction. As Palm Harbor has done for the past 40 years, we are here ready to help you find a beautiful, strong, high value replacement home for your family - - AT A FAIR PRICE! As a company, we are committed to helping Hurricane Harvey survivors who have lost their homes replace them without fear of unfair, opportunistic price gouging. We call this our FAIR PRICE PROMISE. Although our building centers have orders backed up for several months and prices and demand are predicted to rise due to construction material shortages as they did after Katrina, we will be doing our very best to maintain a stock of affordable, available homes for those in need due to storm and flood loss for as long as we possibly can. If you are in need of a replacement home due to Hurricane Harvey, please contact General Manager Dylan Lanier and the Palm Harbor Victoria team at (361) 576-2171 as soon as possible to begin the process of providing a new home for you and your loved ones. Let us put our experience with insurance companies to work to solve your housing needs now. Building homes for 40 years for homeowners along the Gulf Coast means we have had the opportunity to "weather the storm" to protect our customers many times! Another Hurricane Ike customer shares their experience of weathering the storm in a Palm Harbor home. Whether you need a single wide, double wide or triple wide manufactured home, we have one for you. Special detailing abounds in a new home from Palm Harbor! With the recent flooding and hurricane in Houston, home will be in high demand! Shop early for best selection. It's Our Birthday and You're Invited to Save $8,000!! It's our Birthday and you're invited!!! We are turning the BIG 40!! Come to Palm Harbor Victoria this Saturday and help kick off our birthday bash with an ICE CREAM SOCIAL. Look and Buy: Purchase the same day and YOU get a 65" TV as a birthday gift! We are giving away over $8,000 in free upgrades, just for our birthday kickoff!!! Here's what WE are giving YOU! There has never been a better time to buy a Palm Harbor!! Call (361) 576-2171 or email gm010@palmharbor.com to set an appointment. Come out early to beat the crowds! If the kitchen is the heart of this home, then the is Arlington manufactured home at Palm Harbor Victoria is a home everyone will LOVE! The Arlington model at Palm Harbor in Victoria has a wonderful convenient dining area! Soak your cares away in this beautiful master bath in our Arlington model available now at Palm Harbor in Victoria! 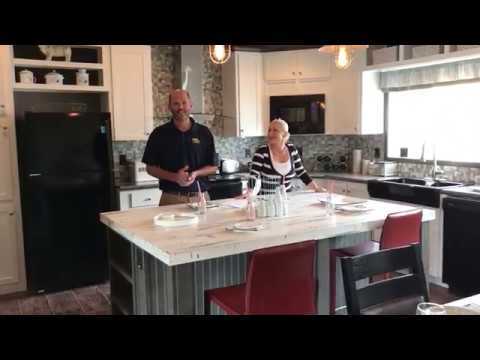 Come on home to the Arlington manufactured home at Palm Harbor during our Big 40 Anniversary Sale-A-Thon! Celebrate 40 Years of New Home Savings, Service and Value with your own Palm Harbor home ! For the best manufactured home company in Victoria Texas - give us a call at (361) 576-2171! Check Us Out On Forbes' List of 100 Best Small Companies! Cavco Industries, Inc. - our parent company here at Palm Harbor Homes in Victoria, Texas - and its family of companies in the construction services industry (That's us!!) are happy to announce that we have been listed # 13 on Forbes® Magazine’s list of "America’s Best Small Companies 2014." Since 1979, Forbes has been compiling a list of their top 100 small companies from all industry segments based on their history of consistent sales and earnings growth. Companies included in this list must have generated less than $1 billion in revenue each year, have been publicly traded for at least one year with a stock price no lower than $5 a share, and may not have been involved in "fuzzy" accounting or have major legal troubles. "Being ranked highly on Forbes 35th annual list of America’s 100 Best Small Companies is a great honor," said Joe Stegmayer, Cavco President, CEO and Chairman of the Board. "This recognition is a testament to the hard work and dedication of our associates to provide outstanding homes and construction services while generating value to our shareholders. We are thankful to our customers, associates, suppliers and our shareholders for helping us earn this wonderful distinction." So if you want to buy your home from the BEST home manufactured home builder, come on in to Palm Harbor in Houston - 7 time Winner of Manufactured Home Builder of the Year and #13 on Forbes Magazine's Top 100 Small Companies in America!! Call us at (361) 576-2171! 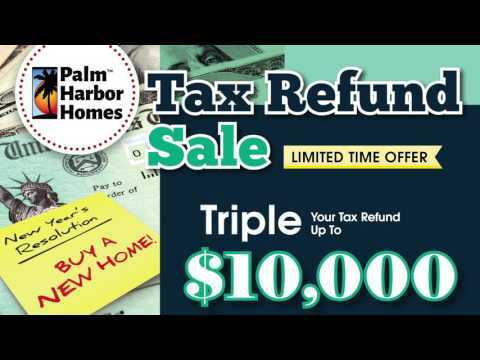 TRIPLE YOUR TAX REFUND IN SAVINGS on a NEW HOME!!! Get up to $10,000 off on selected new homes during our Tax Refund Sale in Victoria! Triple your tax refund* or choose your gift* of a 55" big screen TV, a 43" flat screen TV, a gaming console, a microwave and a ROBOT Vacuum Cleaner or home upgrades on selected manufactured homes, modular homes and mobile homes! This is an AMAZING time to buy a New PALM HARBOR HOME!!! This Promo is for any NEW customer that will bring in their tax return and get big $aving$ on a new home purchase. Mention this ad on you first visit and receive this PROMO PACKAGE!!! * Offer valid at participating retailers only on homes purchased January 1, 2017 through April 15, 2017. Available in maximum amounts up to $2,500 on singlesection, $5,000 on double-section and up to $10,000 on select homes by location. May not be combined with other offers. Not valid on special package priced homes or trade-ins. Palm Harbor Homes is not responsible for any tax preparation. Must secure gift package upon first visit. Actual gift item may differ from illustrative photos based on product availability. See store for details. 3 Bedroom, 2 Baths - priced to sale!!! Cozy livingroom, great for family gatherings!